Dr. Katherine Saul, head of the Movement Biomechanics Lab (MoBL), was selected as a 2019 Faculty Fellow of the University of North Carolina System. Pictured from left to right, Drs. Pearson, Powell, Saul. As a fellow, Dr. Saul will spend one year researching academic affairs. The two other faculty fellows for the 2019 year are Ellen Holmes Pearson, UNC Asheville and Benjamin Powell, Appalachian State University. Each institution is able to nominate one individual for each focus area, and the nominee must be tenured with at least three years on campus. Now in its fourth year, the fellowship engages experienced faculty who are specifically interested in academic affairs issues. 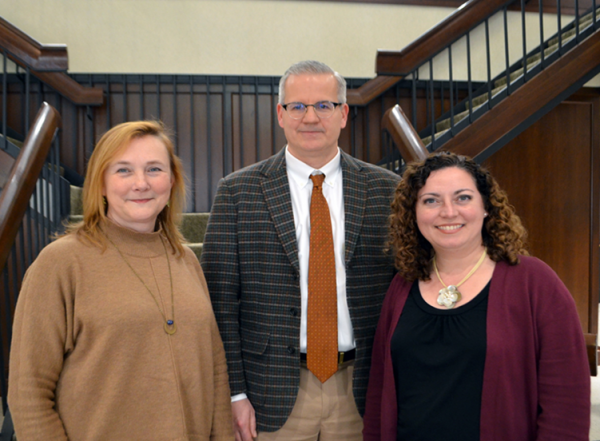 The program gives these faculty mentored learning opportunities and recruits them to enhance the effectiveness of the UNC System, both at the System Office and at the institutional level. Fellows are offered a unique opportunity to become familiar with System-wide, state, and national challenges in public higher education. This year, the UNC System Office selected digital learning as the focus of the project and invited faculty from all 17 institutions to apply. The 2019 Digital Learning Project will provide an opportunity for fellows to assist in introducing new strategies to the teaching and learning environment. They will be immersed in investigating and charting opportunities for faculty to take full advantage of new digital learning environments. The fellows will review the current literature, consult with innovative teaching faculty across the System and across the national higher education landscape, and will investigate, and experiment with, new technologies. View the original article on The University of North Carolina System website.